You know about the main advantage of automatic backup: its inevitability. So it definitely happens if you've ordered it and your data will not be forgotten, and you can assure that your important information can be restored in case of a failure. The scheduled backup allows you to avoid the disaster recovery, a difficult and nothing-promising operation. There are many things that we shouldn't do automatically, but the backup - that is quite different. An automatic backup is a must. You always have to unite a reliable backup system with a regular schedule, otherwise nothing is guaranteed. Weekly backup is appropriate for your media files such as music, video and images. Monthly backup is recommended for backing up all your data. 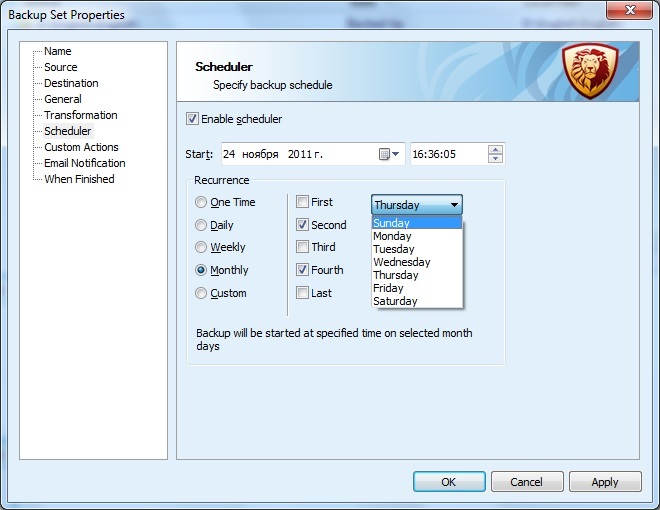 You can easily set the backup to run at the custom period for some particular folders. These steps will ensure that all of your important files can be restored afterwards. Please note to schedule the backups to run automatically at a time that is guaranteed not to conflict with other applications running on the computer. "Pre-Pro run" option will help you to avoid it. NOTE: with our forthcoming feature Shadow Copy you'll be able to perform the scheduled backup of the open files (files in use).